Roles are an entry grouping mechanism that unify the static and dynamic groups described in the previous sections. Roles are designed to be more efficient and easier to use for applications. For example, an application can get the list of roles of which an entry is a member by querying the entry itself, rather than selecting a group and browsing the members list of several groups. Roles are a sort of hybrid group, behaving as both a static and a dynamic group. With a group, entries are added to a group entry as members. With a role, the role attribute is added to an entry and then that attribute is used to identify members in the role entry automatically. Managed roles have an explicit enumerated list of members. Filtered roles are assigned entries to the role depending upon the attribute contained by each entry, specified in an LDAP filter. Entries that match the filter possess the role. Nested roles are roles that contain other roles. Managed roles can do everything that can normally be done with static groups. The role members can be filtered using filtered roles, similarly to the filtering with dynamic groups. Roles are easier to use than groups, more flexible in their implementation, and reduce client complexity. When a role is created, determine whether a user can add themselves or remove themselves from the role. See Section 6.2.10, “Using Roles Securely” for more information about roles and access control. Evaluating roles is more resource-intensive for the Directory Server than evaluating groups because the server does the work for the client application. With roles, the client application can check role membership by searching for the nsRole attribute. The nsRole attribute is a computed attribute, which identifies to which roles an entry belongs; the nsRole attribute is not stored with the entry itself. From the client application point of view, the method for checking membership is uniform and is performed on the server side. Considerations for using roles are covered in the Directory Server Deployment Guide. Managed roles have an explicit enumerated list of members. Managed roles are added to entries by adding the nsRoleDN attribute to the entry. Browse the tree in the left navigation pane, and select the parent entry for the new role. Go to the Object menu, and select New > Role. Alternatively, right-click the entry and select New > Role. Click General in the left pane. Type a name for the new role in the Role Name field. The role name is required. Enter a description of the new role in the Description field. Click Members in the left pane. In the right pane, select Managed Role. Click Add to add new entries to the list of members. In the Search drop-down list, select Users from the Search drop-down list, then click Search. Select one of the entries returned, and click OK.
After adding all of the entries, click OK.
A managed role also allows an optional description attribute. Members of a managed role have the nsRoleDN attribute in their entry. This example creates a role which can be assigned to the marketing department. Use ldapmodify with the -a option to add the managed role entry. The new entry must contain the nsManagedRoleDefinition object class, which in turn inherits from the LdapSubEntry, nsRoleDefinition, and nsSimpleRoleDefinition object classes. The nsRoleDN attribute in the entry indicates that the entry is a member of a managed role, cn=Marketing,ou=people,dc=example,dc=com. Entries are assigned to a filtered role depending whether the entry possesses a specific attribute defined in the role. The role definition specifies an LDAP filter for the target attributes. Entries that match the filter possess (are members of) the role. A search dialog box appears briefly. In the right pane, select Filtered Role. 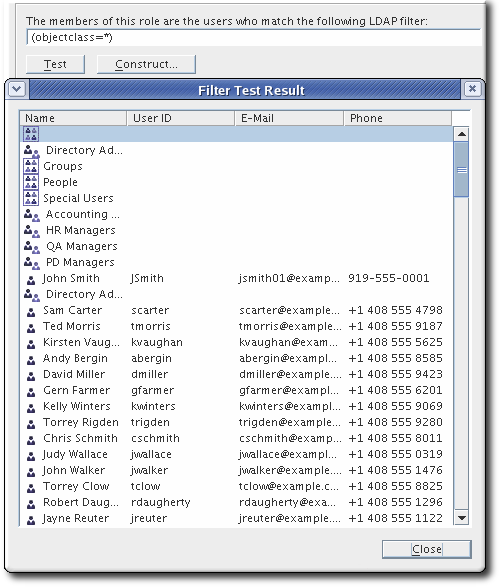 Enter an LDAP filter in the text field, or click Construct to be guided through the construction of an LDAP filter. The Construct opens the standard LDAP URL construction dialog. Ignore the fields for LDAP Server Host, Port, Base DN, and Search (since the search scope cannot be set filtered role definitions). Select the types of entries to filter from the For drop-down list. The entries can be users, groups, or both. Select an attribute from the Where drop-down list. The two fields following it refine the search by selecting one of the qualifiers from the drop-down list, such as contains, does not contain, is, or is not. Enter an attribute value in the text box. To add additional filters, click More. To remove unnecessary filters, click Fewer. Click Test to try the filter. A filtered role entry also requires the nsRoleFilter attribute to define the LDAP filter to determine role members. Optionally, the role can take a description attribute. Members of a filtered role are entries that match the filter specified in the nsRoleFilter attribute. This example creates a filtered role which is applied to all sales managers. Create the filtered role entry. The role entry has the nsFilteredRoleDefinition object class, which inherits from the LdapSubEntry, nsRoleDefinition, and nsComplexRoleDefinition object classes. The nsRoleFilter attribute sets a filter for o (organization) attributes that contain a value of sales managers. Nested roles are roles that contain other roles. Before it is possible to create a nested role, another role must exist. When a nested role is created, the Console displays a list of the roles available for nesting. The roles nested within the nested role are specified using the nsRoleDN attribute. In the right pane, select Nested Role. Click Add to add roles to the list. The members of the nested role are members of other existing roles. Select a role from the Available roles list, and click OK.
A nested role entry also requires the nsRoleDN attribute to identify the roles to nest within the container role. Optionally, the role can take a description attribute. Members of a nested role are members of the roles specified in the nsRoleDN attributes of the nested role definition entry. This example creates a single role out of the managed marketing role and filtered sales manager role. The nsRoleDN attributes contain the DNs for both the marketing managed role and the sales managers filtered role. Both of the users in the previous examples, Bob and Pat, are members of this new nested role. The entries which belong to a role are assigned on the role entry itself. 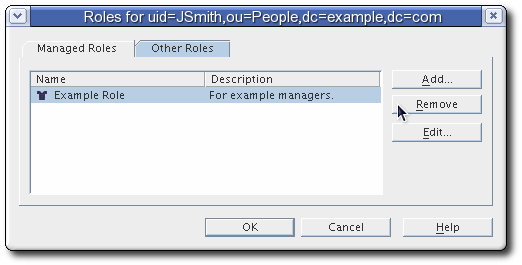 For managed roles, user entries are added explicitly; for filtered roles, they are added through the results of an LDAP filter. User entries are assigned to the role through the command line by editing the role entry, either by adding the entry as a member or adjusting the filter so it is included. In the Directory Server Console, however, there is a shortcut to add entries to a role by apparently editing the desired user entry (but, functionally, this really edits the role entry). In the left navigation pane, browse the tree, and select the entry for which to view or edit a role. Select Set Roles from the Object menu. Select the Managed Roles tab to display the managed roles to which this entry belongs. To add a new managed role, click Add, and select an available role from the Role Selector window. The configuration for a managed role associated with an entry can be edited by clicking the Edit button. The Edit Entry dialog box opens, and the general information or members for the role can be changed. Select the Other Roles tab to view the filtered or nested roles to which this entry belongs. Click Edit to make changes to any filtered or nested roles associated with the entry. 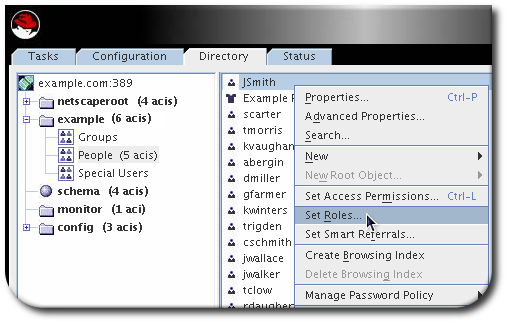 Role assignments are always visible for an entry when it is displayed in the Directory Server Console. Role assignments are not returned automatically through the command line, however. Be sure to use the nsRole attribute, not the nsRoleDN attribute, to evaluate role membership. The concept of activating/inactivating roles allows entire groups of entries to be activated or inactivated in just one operation. That is, the members of a role can be temporarily disabled by inactivating the role to which they belong. When a role is inactivated, it does not mean that the user cannot bind to the server using that role entry. The meaning of an inactivated role is that the user cannot bind to the server using any of the entries that belong to that role; the entries that belong to an inactivated role will have the nsAccountLock attribute set to true. Members of a role can be temporarily disabled by inactivating the role to which they belong. Inactivating a role inactivates the entries possessed by the role, not the role itself. Browse the navigation tree in the left pane to locate the base DN for the role. Roles appear in the right pane with other entries. Double-click the role, open the Account tab, and click the Inactivate button. Alternatively, select the role. Right-click the role and select Inactivate from the menu. 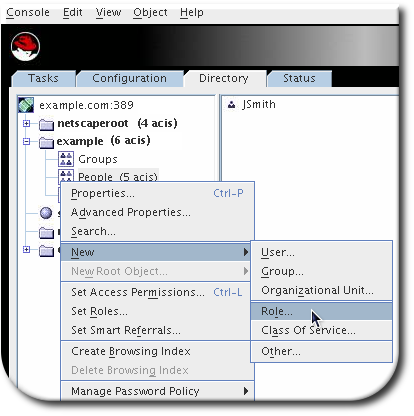 To reactivate a disabled role, re-open the role configuration or open the Object menu, and select Activate. All of the members of the role are re-enabled. When a nested role is inactivated, a user cannot bind to the server if it is a member of any role within the nested role. All the entries that belong to a role that directly or indirectly are members of the nested role have nsAccountLock set to true. There can be several layers of nested roles, and inactivating a nested role at any point in the nesting will inactivate all roles and users beneath it. The Directory Server Console automatically shows the active or inactive status of entries. To see the inactivated entries, select Inactivation State from the View menu. Members of an inactivated role have a red slash through them. For example, John Smith is a member of the inactive Example Role. Deleting a role deletes the role entry but does not delete the nsRoleDN attribute for each role member. To delete the nsRoleDN attribute for each role member, enable the Referential Integrity plug-in, and configure it to manage the nsRoleDN attribute. For more information on the Referential Integrity plug-in, see Section 3.6, “Maintaining Referential Integrity”. Not every role is suitable for use in a security context. When creating a new role, consider how easily the role can be assigned to and removed from an entry. Sometimes it is appropriate for users to be able to add or remove themselves easily from a role. For example, if there is an interest group role called Mountain Biking, interested users should be able to add themselves or remove themselves easily. However, it is inappropriate to have such open roles for some security situations. One potential security risk is inactivating user accounts by inactivating roles. Inactive roles have special ACIs defined for their suffix. If an administrator allows users to add and remove themselves from roles freely, then in some circumstance, they may be able to remove themselves from an inactive role to prevent their accounts from being locked. For example, user A possesses the managed role, MR. The MR role has been locked using account inactivation. This means that user A cannot bind to the server because the nsAccountLock attribute is computed as true for that user. However, if user A was already bound to Directory Server and noticed that he is now locked through the MR role, the user can remove the nsRoleDN attribute from his entry and unlock himself if there are no ACIs preventing him. To prevent users from removing the nsRoleDN attribute, use the following ACIs depending upon the type of role being used. Filtered roles. The attributes that are part of the filter should be protected so that the user cannot relinquish the filtered role by modifying an attribute. The user should not be allowed to add, delete, or modify the attribute used by the filtered role. If the value of the filter attribute is computed, then all attributes that can modify the value of the filter attribute should be protected in the same way. Nested roles. A nested role is comprised of filtered and managed roles, so both ACIs should be considered for modifying the attributes (nsRoleDN or something else) of the roles that comprise the nested role. For more information about account inactivation, see Section 14.11, “Manually Inactivating Users and Roles”.